A driver in pursuit of a parking spot severely injured a cyclist in Queens this morning. 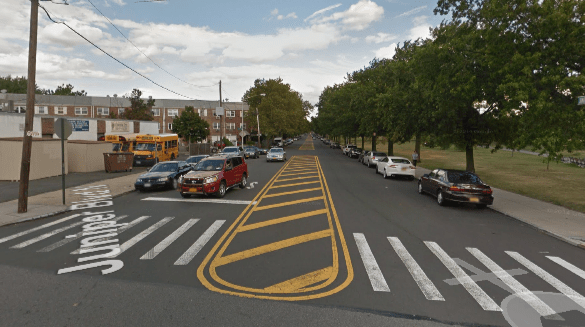 The victim, a 64-year-old man, was traveling northbound on Lutheran Avenue, near Juniper Valley Park in Middle Village, at about 8:35 a.m., NYPD told Streetsblog. Near the intersection of Juniper Boulevard North, a 71-year-old backing up to park hit him with a Honda sedan. The victim was pinned under the car and sustained lower body trauma and injuries to his right leg, police said. He was taken to Elmhurst Hospital in critical condition. NYPD had not released the identities of the victim or the driver as of this afternoon. No charges were filed, police said, and the investigation is ongoing. Lutheran Avenue is a relatively narrow street where the crash occurred, with parking on both sides and no bike lanes. Juniper Boulevard North has two lanes of parking and a painted center median. It’s too wide and dangerous, and it would be a relatively simple matter to calm traffic and narrow crossing distances along the park by adding a protected bike lane, like DOT has done next to other city parks. Update: In September 2015 DOT presented a plan for a bikeway on Juniper Boulevard North, and painted bike lanes or sharrows on two blocks of northern Lutheran Avenue, to Queens Community Board 5 [PDF]. Streetsblog is checking with DOT for the status of that proposal. 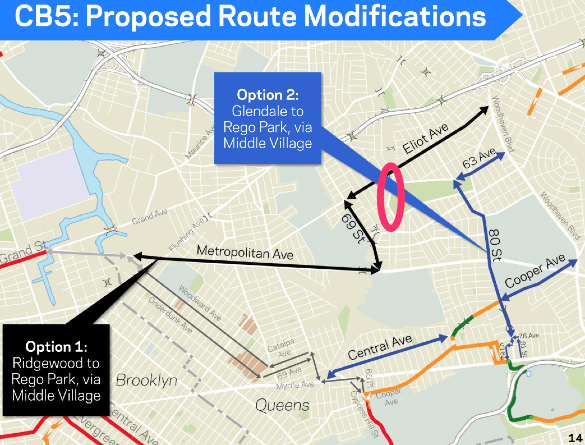 DOT has been working to add bike lanes in Middle Village and Ridgewood, as shown in the map above [PDF]. It’s clear bike infrastructure is urgently needed in this part of Queens. Teachers at Learning Tree told the Daily News there have been several crashes near the school, located at Juniper Boulevard North and Lutheran Avenue, in recent months. Correction: The location of the crash was misidentified in the original version of this post. 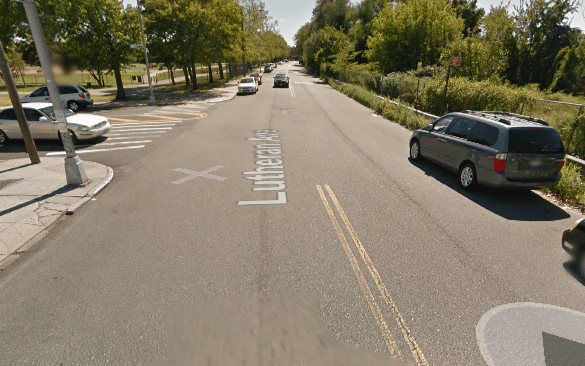 It happened on Lutheran Avenue, not Juniper Boulevard North, according to NYPD. The post has been updated to reflect the correct location. Uggh. Every frickin’ day it’s something. Here’s a chance to test the hypothesis that painting a huge buffer space can be a land-bank to add bike facilities later, but I’m not holding my breath. The plan linked is not worth talking about except for containing the first green backed doorzone sharrows in the United States. Also, is it just me or are the cars in the cross-sections about 6 feet wide? Is this to hide the fact that in real life the bike lanes are flush with the side of parked cars and their doors open across 2/3 of the lane? Juniper Valley Park is one of the nicest in the entire city. Lots of people but a really wide road. Could use a 2-way protected bike lane around the ENTIRE park! What is the part of the street that’s painted yellow used for? DOT does have a plan for bike lanes on Juniper Boulevard N. I just don’t know if it’s going anywhere. In September 2015, DOT presented a plan for a third phase of bike lanes in QN CB5. Juniper Boulevard N was one of the included routes. DOT presented 2 options. The first for a two-way, parking protected bike lane on the south side of the street by the park. The second option was to add two class II bike lanes by narrowing the painted median (this wouldn’t disturb any parking, unlike the first option). No idea what happened to the proposal, the November full board minutes stated that the transportation committee was reviewing the proposal, and I found no mention of it after that. No doubt being held in reserve should more space be needed for cars. Will look into this. Thanks.